Hi! We did it! We made it to Friday! Woohoo! Any plans for the weekend? Saturday, Little Jenny and I are heading to San Francisco to do a little Christmas shopping. The only problem I have, is no one gave me there list, so I have no clue on what to get anyone! That makes it hard, but I am sure I will find things I want for me. Do you ever buy Christmas presents for yourself, wrap them and put them under the tree? I have done that, I say there from my dog. lol! Thursday, was my Girl Andrea’s birthday! She got to spend it at work, but will be spending her evening watching the Twilight premier. Do you like Twilight? Little Jenny is obsessed with it, she must of read the series a hundred times, I personally never got into it, but maybe I should of read the books, I heard they were really good. I can’t believe the Twilight epidemic is still going. For my friend Andrea I wanted to create a special cupcake for her. 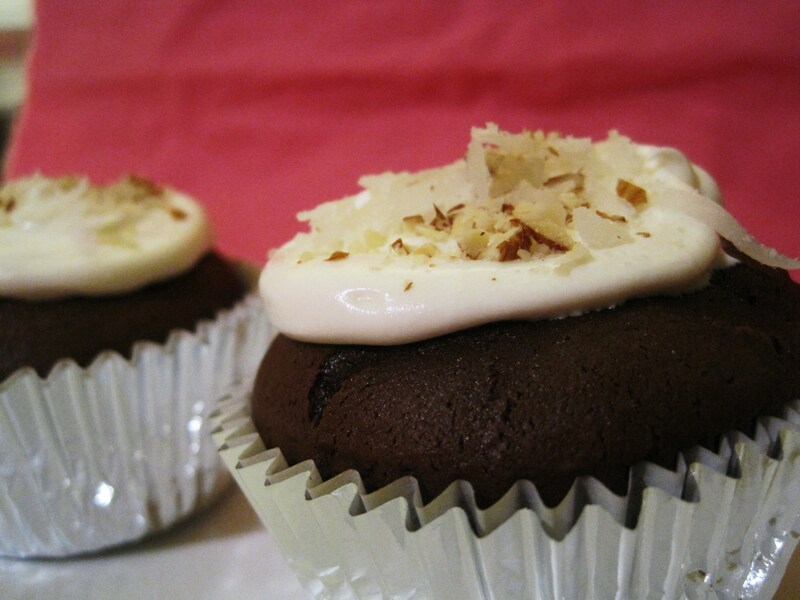 I know how much she loves Almond Joy Candy bars, so I tried to create an Almond Joy cupcake, they didn’t exactly turn out like Almond Joy but there did turn out very good. Everyone at work complimented them. I’m actually pretty proud, best box cupcakes I ever had. Yes boxed! I would of made them from scratch but I did my calorie calculation and oddly enough the box stuff has way less calories and everyone at work including myself is watching calories, but I did tweak the recipe a bit. Instead of water that the recipe called for I used Lite Coconut Milk! OMG! You have to do that the next time you make cupcakes from a box. They turned out moist, and smooth. Smooth is a weird description for a cupcake but it’s the only way I can describe it. Best cupcakes I ever had, glad I had to share them because I would of ate more then two! 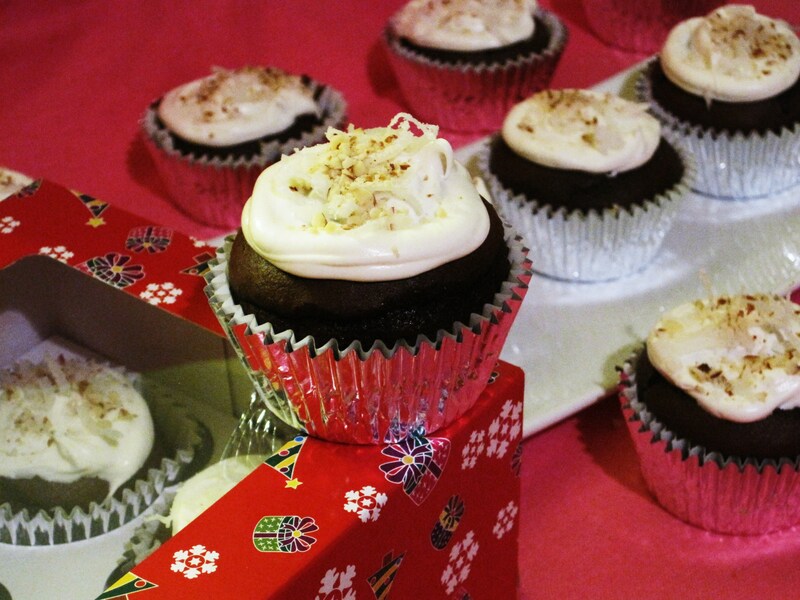 As frosting goes, I used canned vanilla frosting with almond extract. Again less calories then buttercream frosting. No two sticks of butter, and 3 cups of powdered sugar, way less calories for the canned stuff.I think this is the first time making something from scratch was higher on the calorie scale. 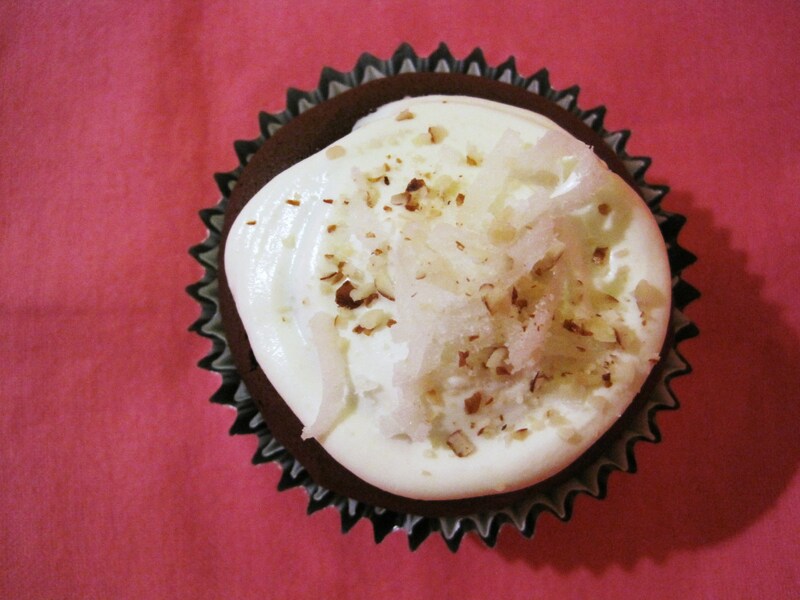 I topped the cupcake with a pinch of sweetened coconut and roasted chopped almonds. It was perfect!! 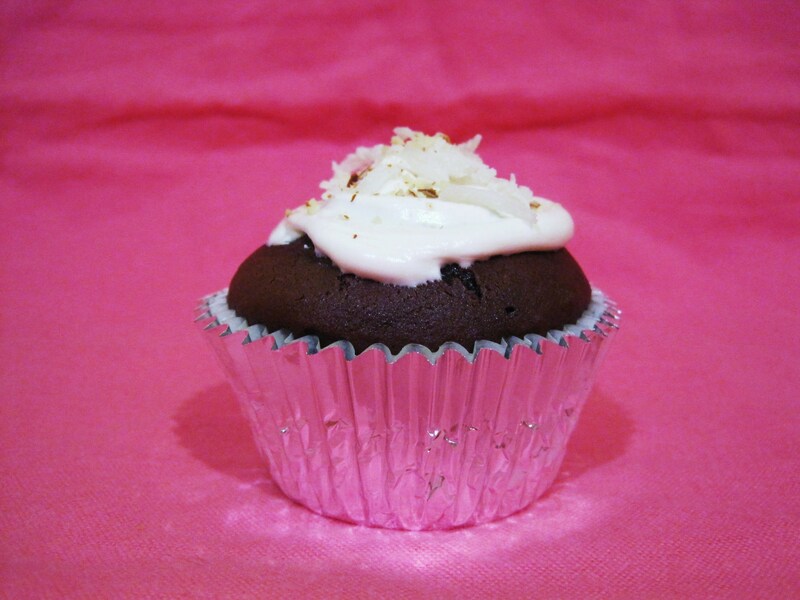 I wish I had a cupcake right now!!! In a large bowl, add cake mix, eggs, oil, applesauce, coconut milk and coconut extract. Mix on low for 30 seconds, and then on high for 2 minutes. 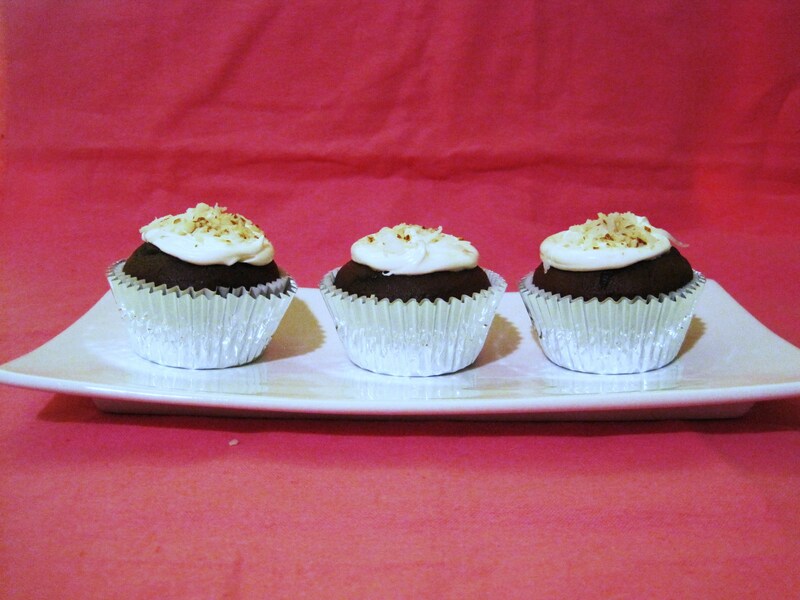 Evenly divide batter into each cupcake cup. Bake in oven for 25 minutes. To test it, poke a toothpick in it and if it comes out clean, it’s done. Once done, when cupcakes are cool enough to touch, place onto a baking rack to completely cool. Meanwhile, take your frosting place in a bowl, add almond extract. Mix around with a spoon until creamy. I placed the frosting in a ziplock bag, cut the corner and frost the cupcakes. I started around the edge and followed the cupcake, making circles. Top each cupcake with about 1 Tbsp. of frosting. Note: You’ll have leftover frosting. Top cupcakes with coconut and almonds. I packed four cupcakes for Hubby, Four for little Jenny and took the rest to work. I’m not kidding you, you have to try this recipe, you’ll love it! Unbelievable! I really think it was the Coconut Milk. 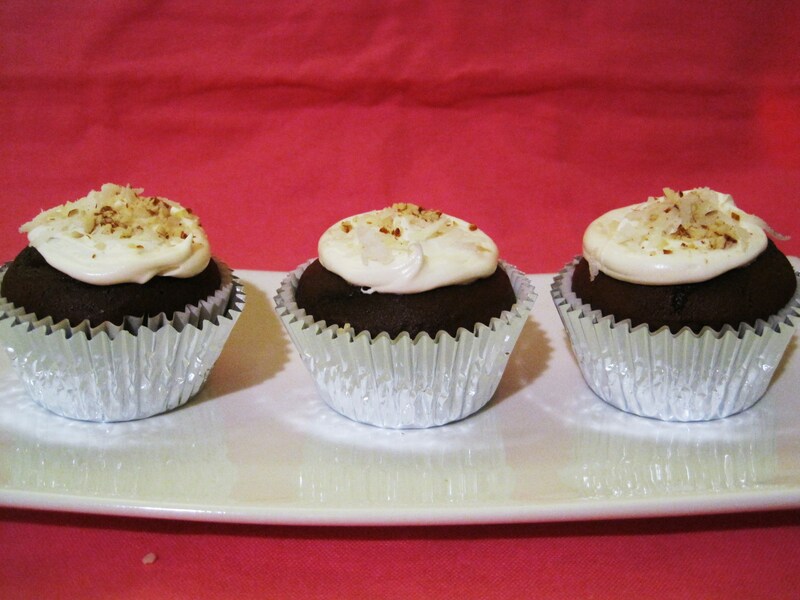 What are your favorite kind of cupcakes? For me anything chocolate! Love chocolate!! Have a great weekend!! Stay warm and make cupcakes!!! Having a peanut butter and jelly sandwich for lunch today? Check that jar before you do! Smucker’s is recalling 3,000 jars of its Smucker’s Natural Peanut Butter Chunky because of possible salmonella contamination. The 16-ounce jars were sent to 24 states and Washington, D.C. According to Smucker’s, the jars of natural peanut butter chunky would have been purchased in the last week or so and have the “Best if Used By” dates of Aug. 3, 2012, and Aug. 4, 2012, along with the the production codes 1307004 and 1308004. The recalled natural peanut butter was sent to Arkansas, Colorado, Delaware, Illinois, Indiana, Iowa, Kansas, Kentucky, Maine, Maryland, Michigan, Minnesota, Missouri, Nebraska, New Jersey, New York, North Dakota, Ohio, Oklahoma, Pennsylvania, South Dakota, Texas, Virginia, Wisconsin and the District of Columbia, according to USA Today. No sickness has been reported yet, but salmonella symptoms can include fever, nausea, vomiting, diarrhea and abdominal pain, according to the CDC. So check those cabinets! Better safe than sick! Thanks for the heads up on the peanut butter! 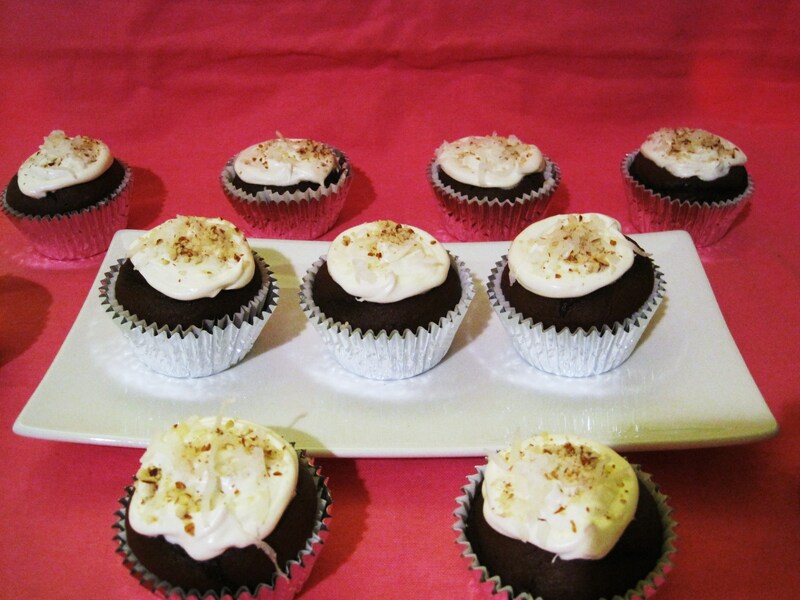 Your cupcakes do look delicious and the tip about flavoring them up with the coconut milk is a tasty one. Happy birthday to Andrea, lucky girl to be the recipient of these gems! Have fun this weekend! I buy myself Christmas presents all year round! Or really….I just buy myself things and justify them by telling myself they’re Christmas presents lol. these cupcakes look fabulous! Honestly, I would never have known they’re from a box since you spruced them up so much! I bought a jar too and it fell within there time lines, used half of it, no one got sick, so I guess were good. I threw it out to be safe anyway. I dont buy Smuckers or Chunky…whew, I’m safe. Your cupcakes look delish! Great job on them and the frosting..you love to make that one of a kind, individual item stuff…I am a pan of bars with a massive schmear of frosting over the top in one fell swoop…ha!